As autumn is drawing in, we're tidying up the garden and getting ready to put it to bed ahead of the winter snowfall. And we've been reflecting on what's worked in the making of a new garden, and what's not. Its been an interesting first horticultural season for us in the Alps. Its hard to believe now, that this time last year, the garden was an enormous mud-bath where the building contractors parked their trucks. The transformation started back in May, when we put down the turf. An expensive way of getting a lawn, but quick and effective. We had to put the sprinkler on it during the summer months, as the alpine summer has been a corker, and without the additional drink, the not-yet-established turf would have turned to straw. We lost a few edges on the turf where it curled up, but they've been replanted with seed and are filling in nicely. Its been interesting to see the difference in the lawn that gets some shade from the sun from the sunflowers, to that section that gets no shade and dries out quicker. Another reason to love the sunflowers. The sunflowers went in as a quick-filler to create some screening from the road. Although we've planted a dog-wood hedge, it'll take a while to mature, and we needed something in the meantime. They've been quick to grow, and just beautifully cheerful to have around. We planted some different varieties, some with single big flower heads, and some multi-flowered varieties. Its meant we've had flowers from July till October. And the bees have just loved them - there's always a few bees feasting on the pollen. Sadly the dog-woods haven't grown as vigorously as we'd hoped, so they've just had a good feed, aiming to get the last out of the growing season. We put some other 'fillers' in along the roadside border, with mixed success. I'd tried to find bronze fennel to grow for the beautiful feathery foliage, but no joy. Instead I picked up some bog-stand bulb fennel at the market, which has been better than expected. Some we've eaten (its great on the hot-rock, served with melted raclette cheese), and some we've left to enjoy the foliage and lovely big umbellifer flowers. I'm on the hunt for the bronze fennel next year though. On the lower storey, the brown leaves of heucheras have been beautiful, and they've established well. Similarly, ladies mantle self-seeds in abundance here, so I've been moving blocks of it from unwanted places to fill in some of the gaps as its good ground cover. I experimented with a 'melange' of stocks from the market... they were truly horrendous. The colours looked like an explosion in a 1970s kodak factory, and the whiff of municipal planting was just too great. We won't be doing that one again. The shrubbery around the back of the fire pit seems to have gotten off to a good start, but really needs to mature into itself - its still a bit sparse looking. There's red and white currants, lavenders, a smoke-bush, and a forsythia, all on the bank. Right at the back, the multi-stemmed birch has settled into its 'corner marker' position nicely, but the red acer palmatum hasn't really thrived. The total star of the show for that corner of the garden though, is the chocolate cosmos. I put it in as a bit of a punt - I love the chocolate scent - and the brown flowers should sit well with some of other brown foliage plants in that space. It has thrived - its twice the size it was when it went in during June, and its still flowering now in October. The potager has kept us in veg all through the summer. We've enjoyed beans, cucumbers, pumpkins galore, lettuce, strawberries, chard, spring onions, leeks, thyme, basil, chives... and of course, courgettes. I exercised restraint and only planted two courgettes. The regular shaped, but yellow fruited one, was prolific. At the height of summer we were picking a courgette every two days. The other one, with round fruits, was less successful. Either we picked them too soon, and they were rock solid, or we left it too long and they were bland and squishy. And we lost quite a few of the fruits. We'll give that one a miss next year. Swiss chard, grown in France obv. Potager pie. Green stuff, eggs & cheese. Yumm. The wildflower meadow bank has been an unmitigated disaster though. We carefully hand weeded the bank and pulled out the bindweed & couch grass (or so we thought). The lower parts of the bank were planted with fritillaries, gentians, lemon balm & saxifrage to give some instant life, and the rest and sowed the wildflower mix. We got some beautiful cornflowers, nigella, honesty, californian-poppies & some triffid-like cosmos. But the whole thing got over-ran with bindweed, and various other alpine meadow weeds that I didn't recognise. Attempts at weeding it were fruitless, as each time I climbed the bank to tackle it, I'd trample some of the wildflowers. That element definitely needs a rethink before next year. After seeing the beautiful wildflower meadow planting by the Lac aux Dames in Samoëns, I'm not giving up on the wildflower meadow just yet, but we need a different planting mix. I've got some seeds for more grasses to go into the mix for next year. Lets see if that makes a difference. So, plans for next year's garden. Pretty much the same again with the potager I think, and the sunflower roadside border. There's a long border around the back of the chalet, that separates us from the meadow behind. Try as we might, the natural flora is going to keep encroaching into the flower bed, so I'm thinking to go for a Piet Oudolf inspired prairie-planting style, with plenty of tall grasses with movement, and purple-themed flowers. There's a beautiful purple salvia in there at the moment that's done well, so as long as I can over-winter it and get some successful cuttings from it, I think that'll be the repeated colour/flower presence in that border next year. I'd really like to lay hands on some acanthus (bears breeches)... I think it'll go well here. We used to have some in the garden at Ealing, its upright spikes were rugged and majestic. I haven't seen any in the garden centre though, so I'm on the look out for anyone doing an divisions on theirs, as it propagates easily. The snow has melted down in the valley and we're now getting stuck into the garden. When I say we, obviously I mean Sid for the digging marathon. I've been plant shopping :). Fruit trees have been procured and will soon be planted in the garden, as soon as the torrential rain stops. There's peach, cherry, apricot & fig - it's a mini-orchard. The dogwood hedge has been planted, and is slowly coming to life with new green leaves. Seeds for the veg patch have germinated, and we're gently hardening them off before planting out in May. The nice lady at the local nursery says nothing goes in before 15th May. It's tempting to do it now, but I'm taking her advice. And plans are being sketched with our garden designer friend Kathy for the garden layout and planting scheme. There's going to be lawn in front of the terrace, some paving to a curved seating circle sunk in to the bank, and a sunken fire-pit-come-BBQ. 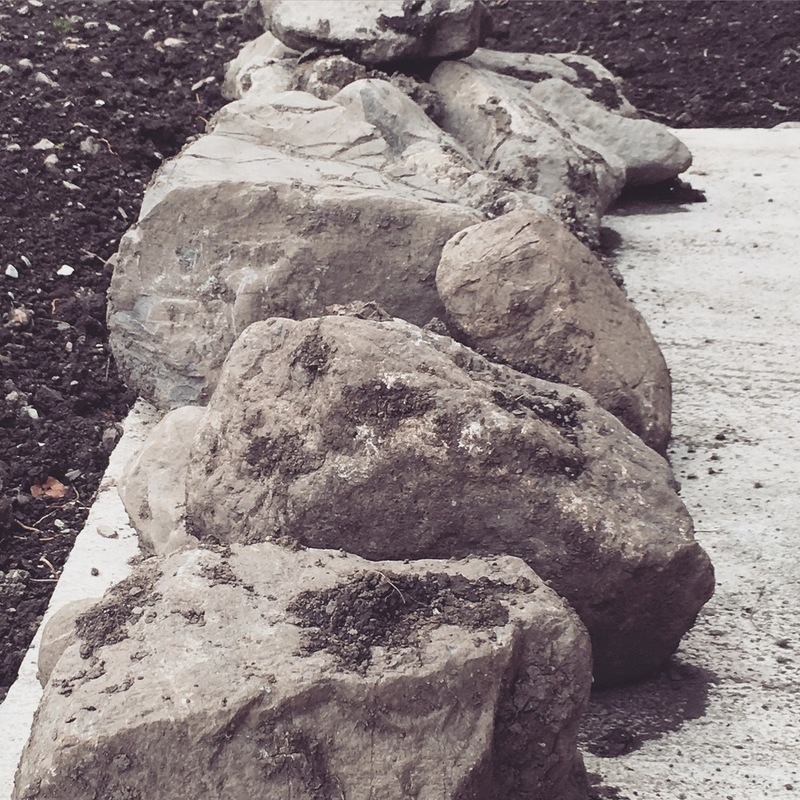 Now what to do with the enormous rocks that are coming out of the ground...? Gardening. The start of the marathon.